968 pages | 327 B/W Illus. 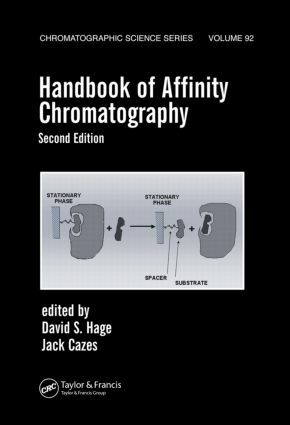 This essential handbook guides investigators in the theory, applications, and practical use of affinity chromatography in a variety of fields including biotechnology, biochemistry, molecular biology, analytical chemistry, proteomics, pharmaceutical science, environmental analysis, and clinical chemistry. The Handbook of Affinity Chromatography reflects upon important factors to consider in the development of affinity methods, such as the choice of support material, immobilization methods, and application or elution conditions. It reviews common affinity methods and explores the latest preparative, analytical, and biophysical applications, including the use of affinity chromatography with other separation techniques and analytical systems. This basis seamlessly supports the discussion of recent developments in techniques including the use of affinity ligands in capillary electrophoresis, mass spectrometry, microanalytical systems, and optical biosensors. New chapters feature expanded discussions on molecularly imprinted polymers and biomimetic ligands, chromatographic immunoassays, affinity-based immunoassays, affinity-based chiral stationary phases, and affinity ligands in multidimensional systems. Engaging the collaboration of 48 scientists and students from 23 laboratories and organizations to present the latest information on affinity methods, the Handbook of Affinity Chromatography illustrates a wide range of applications and theory for scientists, students, and laboratory workers throughout the fields of chemistry and biology.